At 8 am on Tuesday (June 9th), I'm sitting in Campus Martius Park, a 2.5 acre urban park/open space in the center of downtown Detroit, waiting for Bob Gregory to arrive. 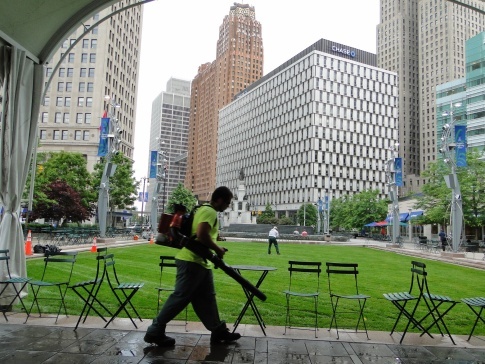 Workers are busy cleaning the park -- billed as "Detroit's Gathering Place" -- but they're not city employees. Instead, they work for the Detroit 300 Conservancy, a non-profit, business-supported organization that Gregory heads. Campus Martius is noteworthy on at least two counts. 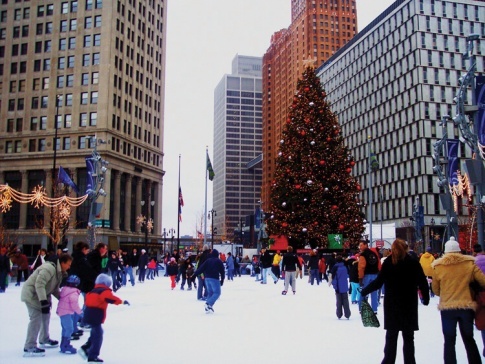 First, it's a vivid demonstration of the desire Detroiters have for a downtown open space. Second, it's an indicator of the trend towards privately managed public space in our downtowns. Campus Martius -- for more on the strange name see the end of this post -- is actually in its second incarnation. There had been a public park in this location early in the 20th century. Back in the 1930s, Gregory tells me, downtown Detroit had the densest concentration of pedestrian traffic of any major U.S. city (note: haven't been able to verify this). 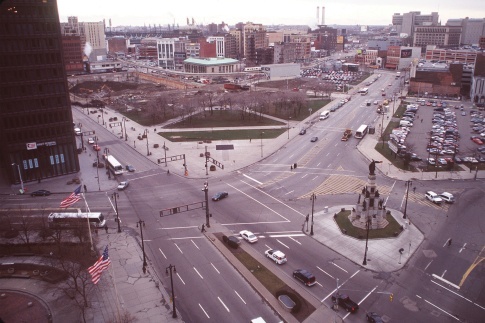 But as automobiles replaced transit, Detroit's leaders replaced the park with roadways. See photo below for site of today's Campus Martius. 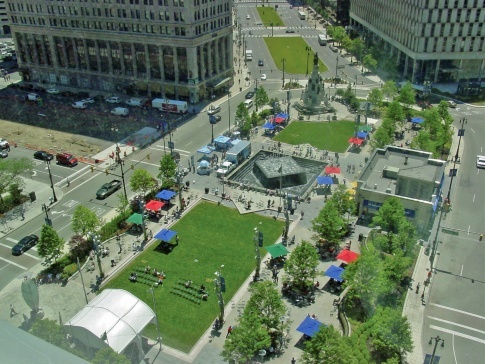 Detroit's business leaders have eliminated the asphalt roadways and returned a public space to the heart of downtown, in the form of a new, "souped up," Campus Martius. Above photos provided by the Detroit 300 Conservancy. The open space is pleasant enough early in the morning. But it comes to life at lunch time, when nearby office workers crowd in with their brown bags, or swing through the Au Bon Pain cafe. As Gregory explains, the Detroit 300 Conservancy is responsible for programming at Campus Martius. In fact, programming is central to its mission, because it is the programs and planned activities that draw people not just at lunch time, but during evenings and cold Winter days. Gregory ticked off some of the events: Saturday night movies; outdoor theater and dance; the Jazz Festival in September; the Motown Winter Blast; car festivals; daily ice skating from November through March; and more. 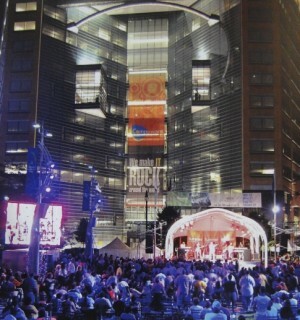 Campus Martius also draws many going to Detroit Tigers games in Comerica ballpark, just a few blocks away. (note: aerial, skating, & night concert photos provided by Detroit 300). 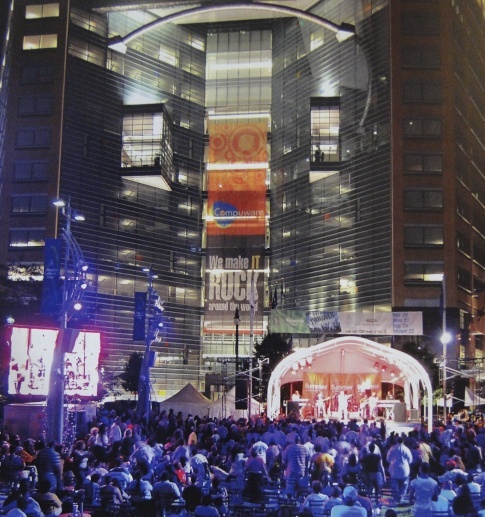 Campus Martius is loaded with high-tech features designed to enhance the visitor experience. Gregory pointed out two carefully tucked away hydraulic stages used for concerts, and described the sophisticated lighting and specially zoned sound systems. 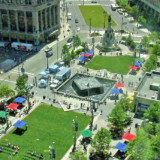 The impetus of the re-born Campus Martius, Gregory told me, came from a plan prepared for Detroit's Downtown Partnership in the late 1990's by the Toronto firm, Urban Strategies. The business community, in celebration of Detroit's 300th birthday, wanted to leave a "legacy gift" to the City, in the form of this new open space. As the City didn't have the financial resources, this was the only way Campus Martius could be built and maintained. The model drawn on was New York City's Bryant Park and Central Park, also maintained by private non-profit conservancies. Twenty million dollars was raised from Detroit corporations and private foundations. The result, an attractive, well-used, open space (opened in 2004, and expanded in 2007), managed by the Detroit 300 Conservancy under contract from the City. Concert in Campus Martius Park. Photo provided by the Detroit 300 Conservancy. It's an interesting question whether one of the key downtown open spaces for a wide range of events should be developed and managed by a private entity, even if it's a non-profit with the best interests of the city at its heart. But that's the reality of 21st century America, at least in fiscally-strapped cities, where the only money available to invest comes from the private corporations (motivated by civic values, a desire to preserve the value of their own corporate assets, or perhaps some combination of the two). There are some restrictions on use of the park. As Gregory informed me, "there is no soliciting, leaflet distributing, etc. in the Park, except for companies and organizations that are approved Park sponsors and partners." One of the key aims of Campus Martius, Gregory told me during my visit, is to be "a catalyst for economic development" and "counter the view of Detroit as a devastated, bombed out city." 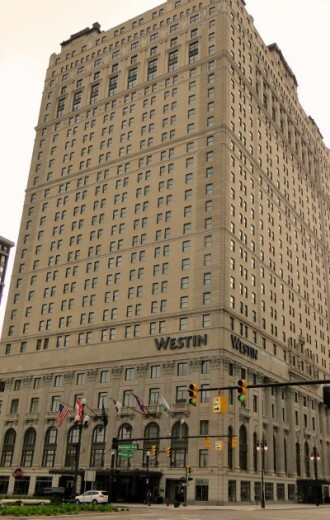 The Book-Cadillac building in downtown Detroit was converted into a hotel. Compuware, a major provider of information technology services, moved its headquarters from the suburbs to a new 1.1 million square foot building overlooking the open space. Gregory also pointed to the restoration of the nearby Book-Cadillac building (left) as a new Westin hotel -- something that Preservation Wayne Director Karen Nagher also mentioned to me as a positive sign. But there's still no major retail businesses downtown in America's 11th largest city (population 917,000). Part of the site of the huge Hudson Department store demolished in 1998, just a block away from Campus Martius, is still vacant. Photo above left shows site of demolished Hudson's department store. Above right: Compuware's headquarters, which also occupies part of former Hudson's property, while fronting on Campus Martius. In today's tough economic climate, Gregory notes, "the challenge is to keep Campus Martius going." That was further highlighted during my visit to Detroit by talk about General Motors possibly pulling its headquarters out of downtown. 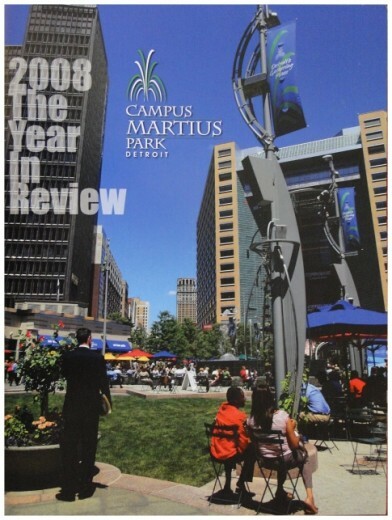 Why "Campus Martius"? The name is from the Latin for "field of Mars," and was used in the early 18th century to reflect the military origins of Detroit as a French, and then British, controlled Fort. There's a Good Story Here!